Well, I do, of course! That's why, after thinking about it for weeks and weeks, I decided I just had to give you guys my half finger gloves pattern for the small blue KK for free! They are awesome! Not quite as awesome as my efg version I first showed off to everyone on the yahoo groups, but still awesome. And you can do so much with them! Don't be limited by my yarn choices and/or stitch patterns! I am working on a pair right now that I am knitting with the regular knit stitch throughout (rather than the e-wrap) and I put a cable on the cuff (I just had to borrow the idea from Isela's adorable cabled mitts only I am not quite doing the same cable pattern and I am doing a button closure instead of seaming these babies up). It's my seventh pair, maybe why I am starting to get booooooored with knitting half finger gloves? Download your copy today and play around with the pattern. I am still going to put together a conversion to the extra fine gauge loom for those waiting for that pattern. I have been so busy lately and everyone in my house has been so sick with the flu, pneumonia, stomache troubles and what have you I just have not gotten around to that pattern yet. So, before winter slips away and no one will even care about these cool half finger gloves anymore, I will put up a conversion chart in a few days for ya! Deal? Oh, and if you download my pattern, I sure would like to see a picture so I can start a gallery! I had the pleasure of attending the Craft Council of America's Knit-Out and Crochet 2008 event at the Mall of America in Bloomington, MN on Saturday February 16th. This was only the third time I set foot in the great Mall of America. The last time was seven years ago when my first born was just a baby. What a place! What an amazing event! And my, oh my were there ever the people there! Most importantly, for anyone who knows anything about loom knitting, the most important person in our little loom knitting circle was there! The sole purpose of my attendance at this giant event! My only goal was to meet this talented woman. 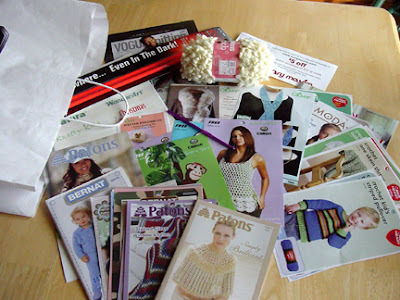 Yeah, sure, bonus for the free patterns, crochet hooks, skeins of yarn, and knitting needles! Well, after what seemed like hours of wading through the constant flow of people (all the time carrying my two year old daughter, I might add), I finally spotted her. At least I thought it was her. I could barely see the back of her head peeking through these giant glass elevators. I was behind the speakers so the voices were muffled but I thought I heard this woman say she was Isela Phelps! The very long line I was standing in slowly inched forward. The microphone was handed on down the line of ladies seated at the long table on the stage. Each author introducing themselves as they held up the books they had written. Finally I reached the side of the stage and I got a better look at the ladies sitting on stage. It was her! But how was I going to meet her face to face???? Ohhh, the agony! My arms ached from holding my daughter...I was so hot I could pass out right then and there (there were so many bodies in one place)...my son and my other daughter kept wanting to wander off and my stress level was very high from making sure they were in sight at all times all the while thoughts of someone snatching them up kept coming to mind...the line inched further along. Eventually the line I was standing in for free stuff moved further away from the stage and from the person I attended the event for in the first place. I didn't think I was going to find her again in this avalanche of people! I looked back and the authors had moved off of the stage. Oh well, I thought, at least I got to see her. I checked on the schedule of events and noticed Isela had a demonstration at 11:00 a.m. Checked my watch, 12:30! Dang nabit! I missed the demonstration too (the traffic was horrible getting to the mall and we just couldn't find a parking spot so we were late getting there)! Just about then my two little girls needed to go potty! Arrrrrrrrrgh! I stood in line this whole time and now they need to use the potty?? My sister and her friend said they would watch my son and told me to just go and come back to the line when we were done. Note to ladies in line behind me: So, sorry, my little girls need to go potty! As my husband and I waded toward the bathroom I looked back over at the stage, I noticed these tables with the authors sitting at them! Whoooooooo hoooooo! Then I saw her! She was quietly sitting there and I walked right up to her and introduced myself! Isela shook my hand. I told her my name and my yahoo and Ravelry user name and told her I had just tested knitted her cabled mitten pattern for the Loom along on Ravelry. She knew who I was and thanked me for my help. She asked me if I was enjoying myself and the only thing I could think to say was how terribly hot I was! She introduced me to her talented husband Sam. I shook hands with him and asked him about those cute little looms they were giving away. He told me about Isela's second demonstration at 3:30 that afternoon and he told me they would hand them out at that demonstration. 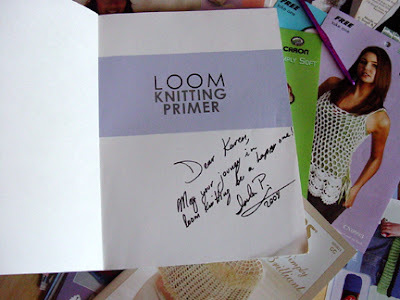 I handed Isela my Loom Knitting Primer book and she signed it for me! While she was signing it, my four year old daughter tugged on my sleeve telling me she had to go potty! Oooooh, the agony! I wanted to chat with her longer! Catch 22! If they hadn't had to go potty I wouldn't have gotten to meet her, if they hadn't had to go potty, I could have chatted longer! LOL! At least I got to meet her and I got her autograph! Isela stood up and shook my hand again and I dejectedly walked off toward the ladies room! Oh, why couldn't my hubby have taken them to go potty??? Oooooooooh nooooo! I left without getting my picture taken with her! I brought my camera and didn't think to get my picture taken with her??? What a doodoo bird! Ok, I thought, I have another chance, I can go to her demonstration at 3:30! My spirits lifted. We found our way back to the line where my sister and my son were after the "potty break". I excitedly told my sister I got to meet Isela Phelps! My sister doesn't know a thing about loom knitting, she is more into needle knitting instead. She asked me who she was. I showed her the book I had and her autograph. She said that was cool. We stood in line waiting and inching along for about 45 minutes longer picking up free patterns and crochet hooks and knitting needles. Eventually we reached the end of the line and the kiddos had had enough. Everyone was hungry and thirsty. And I was exhausted from carrying my two year old. The Mall of America is four levels. Since I hadn't been there in seven years I had no idea were the food court was. My sister's memory was a bit fuzzy on that too (even though she had been there more recently than I). All the while carrying my daughter (she just wouldn't go to my husband and she was so scared of all of the people she wanted me to hold her), we wandered around from floor to floor trying to find a place to sit down and refresh ourselves. Eventually my sister and her friend decided they wanted to just leave the mall and find a place to eat away from the mayhem. I hesitated since I really wanted to go to the loom knitting demonstration at 3:30. We seperated and my husband and I remembered we had seen a Subway somewhere so we set out trying to find it. 45 minutes and several floors later we finally found it! It was 2:00 p.m. The kids were tired and cranky. We promised them rides (there is an amusement park right inside the Mall of America) if they just held out a little longer. After we ate we headed for the amusement park. Alas, we just didn't have enough money on us to purchase tickets. Ideally, if you want to go on rides you buy tickets at the beginning of the day and ride all day. It didn't look like you could buy tickets individually to ride only a few rides. An all day pass for one person was all we had. The kids were heart broken. We promised them we would take them during the week sometime and bring enough money for everyone to ride next time. It was just too much, the kiddos were tired and dissapointed. It was 2:45 and my four year old daughter threw herself on the floor of the mall and cried. We had to go home. I left the Mall of America with lots of patterns, some free yarn, a crochet hook, a set of lighted knitting needles and my autographed book of Loom Knitting Primer, but no cute little loom keychain (sniff, sniff), and no picture with Isela. Perhaps next year??? Bring camera and use it! Arrive in plenty of time to go through the lines of free stuff so I can find the people I want to see and spend more time chatting with them! First I get the flu, then I come down with this mysterous stiff neck thingy I have going on and now I have a cold! Well, I am trying to balace things out a bit here so I think I should be the one to win the Tri-fecta random drawing today on the Five Days of Giveaways contest featured on the Chased by Children blog. Perhaps I can tip the scales a bit by letting the blogger know I am chased by six children everyday! LOL! I can't move it. It won't turn from side to side or up or down. I just recovered from the flu a few days ago and now my neck feels like I've been hanging from a noose for a week and a half! I don't know if it is related to the flu. My throat is sore now too. I sure hope it gets better soon because this weekend is the Craft Yarn Council of America's (CYCA) second annual Knit-Out at the Mall of America, February 16 and 17th, 2008. I don't live far from there and I sure would like to see Isela in person. I don't know if I'll get a chance to actually speak to her, but would still like to at least see her. She is giving away the most adorable little keychain too that I certainly wouldn't be able to resist. 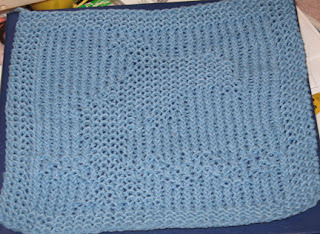 I finished my dishcloth exchange cloth today despite the intense pain in my neck. It was my own design. I just happen to catch a post from my exchange partner on another group where she commented about liking a certain something and I had to grin because the cloth I designed just for her had on it just what she said she loved! Patting myself on the back for that one! My half finger gloves class is in full swing over on the yahoo group LoomClass. There are a few people who have finished and a few who are well on their way there. I am so happy everyone is enjoying this pattern! Once the class is over I will share my pattern here. I will start taking special orders for the DVD demonstration for the extra fine gauge version around this time too. I decided I would just make copies for those interested and sell those along with the pattern for the efg sock loom. 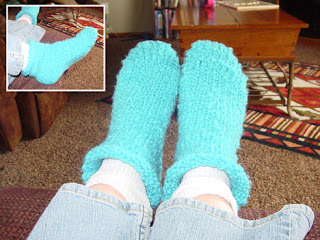 I was able to finish my Plushy House Socks for the January LAL on Ravelry on Thursday last week. Just before I came down with that aweful flu. My feet felt just horribly cold with that flu and those socks were just the ticket to help keep the chill at bay! Thank you so much Isela for the wonderul pattern and for sharing it on the LAL. I have had a busy week (and it's only Tuesday)! Well, actually, I've been rather busy a lot lately so I hardly ever know what day it is anymore since they all just run right into eachother. I hardly know where to begin! Keep reading though to find a treasure hidden in this post because, well, it's Tuesday! Saturday my hubby and I spent nearly a whole day first getting to then sitting through our first Alpacas of MN meeting. It is of course all new and we only knew a few people there. Despite not knowing many people, I apparently knew at least two of the right people and managed to get nominated for the Hospitality Commitee. I will be responsible for the Northwest quadrant of Minnesota. I think it will be a good thing so I won't complain. I think it will be a great way to network within the alpaca community without too much commitment :D.
After our trip back from our meeting my hubby and I tortured ourselves with taxes for hours upon hours on end. We now have five different business entities to do taxes for and man is it ever a pain in the you know what! Since we have businesses that are incorporated we need to file by March 15th. I sure could have found something much more enjoyable to spend the rest of my Saturday and my whole Sunday doing! My son has been terribly sick with the flu. So far he's the only one of six (little kiddos) to come down with it so I am keeping my fingers crossed! I will really be busy if the rest of them get that way too ;-( Good thing my hubby is taking me to Las Vegas in April! Our first vacation in what, four years??? If you hadn't heard yet, I chatted a bit with Denise Layman on her Knitting 911 call in show this past Sunday. I would highly recommend checking her show out! Denise has a great on air presence. She made me feel very comfortable even though she told me I was live and was being recorded. Denise is also a great problem solver and she would love to hear your knitting emergencies! She has a blogtalkradio link on her blog at KnitChat.com with the show she did on Sunday. So, don't be shy, give her a ring on her next show with your knitting emergency, I know she would love to hear from you! I have a new pattern for you today! Yeah! It was so graciously test knitted up for me by my friend Lisa Anderson. She did a fabulous job! She didn't use a fine gauge loom as I had written in my pattern to use, but rather a small gauge AJAL loom and it turned out well. It is a leaping dolphin! Bind off loosely with the crochet method, using one chain stitch in between each loom loop. Weave in ends with yarn needle.